The Silvertowne housing complex has received $9.5 million in new funds that will pay for remodeling and needed repairs as well as preserve affordability for residents. “We are very excited to say the least,” said Chrislyn Prantl, chief executive officer for Integrated Supports for Living, the Salem nonprofit that operates Silvertowne, located at 1115 Mill St. in Silverton. Silvertowne has 86 units that were built in two phases and aims to serve low-income and disabled tenants. Rents are restricted to no more than 60 percent of the area median income. Some of the apartments are limited to those that earn just 30 percent of the area median income. 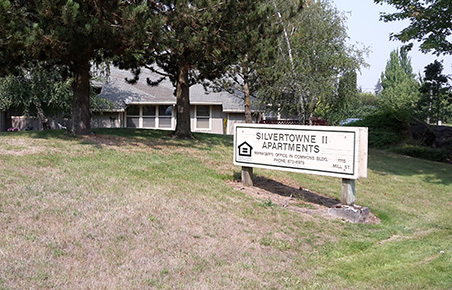 The average age of Silvertowne residents is 79, said Ariel Nelson of Oregon Housing and Community Services, which provided $2.7 million in funding. Fifteen households at Silvertowne include residents with disabilities and 33 of the households earn less than 30 percent of the AMI, Nelson said. “The funds will allow the property to pay for much-needed repairs without affecting the affordability of the complex for residents,” Prantl said. The remainder of the funding comes from the Oregon Housing Finance Agency’s low income housing tax credit program. Prantl said the funds will be used to pay for new roofs and siding, insulation, doors, trim, gutters, flooring, cabinetry, sinks, bath and kitchen counters, and some appliances, as well as accessibility features for units reserved for residents with disabilities. Both properties will also get upgrades to their grounds, including new landscaping, repaving the roads and parking lots, regrading slopes and repairing drainage systems, and replacing sidewalks. The site upgrades also will include meeting the most up to date ADA standards. IS Living also plans to add a centrally located leasing office/maintenance building that Prantl said will allow the nonprofit to better serve residents of both Silvertowne complexes. North James Street proposal: The Silverton City Council voted 4-3 Aug. 20 to deny the appeal of developers who were hoping to build a 40-lot subdivision on 9.5 acres on North James Street between Jefferson and Hobart. Councilors Matt Plummer, Dana Smith, Kyle Palmer, and Jason Freilinger voted yes to uphold the Planning Commision denial; Jim Sears, Laurie Carter and Rhett Martin voted against the denial. The council vote affirmed the July 10 Planning Commission vote to deny the application of developer Gene Oster. Traffic in the area around the project was the key driver of the decision. This was the second iteration of the project. The Planning Commission approved an earlier plan, but the Council rejected it last December. Oster has 21 days to appeal the latest council decision to the state Land Use Board of Appeals.